Bigger, deeper, tougher and better than ever. After jumping up to claim a spot in the UCI racing calendar the Larry H. Miller Tour of Utah delivered its best race yet with Levi Leipheimer returning to his former stomping grounds and, with the much-needed help of his Radio Shack teammates, captured his second straight overall title in the race. Leipheimer, who followed his Tour of Utah victory with a win at the inaugural USA Pro Cycling Challenge in Colorado two weeks later, fought of relentless challenges and attacks from a surprising threat out of Colombia as the Gobernacion de Antioquia team animated the race from the very moment they hopped on their bikes. Even with the prologue being a short little race, everyone expected lots of pain and suffering as 118 riders emptied themselves riding up the road at the Utah Olympic Park. What people didn’t expect, was to see the Colombian team Gobernacion de Antioquia assert itself so strongly. Lead by Sergio Luis Henao, Gobernacion displayed its climbing prowess in a big way by claiming the yellow jersey and raising all sorts of eyebrows as they flew up the mountain. Henao posted the fastest time as he climbed the brutally-tough 1.25 mile hill at just 4:05. RealCyclist.com’s Francisco Mancebo was second at two seconds back and Gobernacion’s Oscar Sevilla rounded out the podium only five seconds off the pace. Lurking in the background, though, were a quartet of American heavyhitters with HTC-Highroad’s Tejay Van Garderen, Radio Shack’s Levi Leipheimer and Garmin-Cervelo’s Tom Danielsen and Christian Vandevelde. Gobernacion placed seven of its eight riders inside the Top 47 riders and none of the eight were more than 35 seconds back – setting the stage for what became a week of fireworks provided by the Colombians. on Historic 25th Street. However, it didn’t seem like it would be the deciding stage in the race – especially not with four more days of racing left on the schedule. But when Leipheimer, Henao, Sevilla and Janez Brajkovic (Radio Shack) managed to sneak away from the peloton on the third ascent of the pass, everything changed. With Kelly Benefit-Optum Health’s Jesse Anthony in a breakaway ahead, Leipheimer looked to his side and decided to see who still had some legs after chasing an early breakaway down. Leipheimer’s move, which Brajcovic followed, surprised all but Henao and Sevilla. As the foursome crested the summit, they had a sizeable lead over what was left of the peloton and charged down the hill hard. Anthony, tired after his solo attack on the early break, tucked in behind the foursome and caught his breath while expecting the peloton to regroup and chase them down after the climb. A funny thing happened, though. The chase never got organized and with the Leipheimer group working as cooperatively as a team time trial, the gap grew to nearly three minutes as they headed around the reservoir and into Ogden. Anthony, refreshed after sitting on for the final 20 miles of the stage and not viewed as a strong threat to the overall title, easily sprinted past his four breakaway riders for the stage win on 25th Street in Ogden. Henao retained his yellow jersey by finishing second while Leipheimer, Sevilla and Brajkovic were all awarded the same time. The rest of the contenders, however, didn’t cross the finish line for another 2:35. That result created a sense of relief among the five breakaway riders while shattering the rest of the field. The handful of riders expected to challenge for the overall win — including Van Garderen, Danielson, Mancebo and others – knew they’re race in Utah had changed dramatically. A shot at the final GC podium was all but gone and stage victories were now the focus for most of that group. 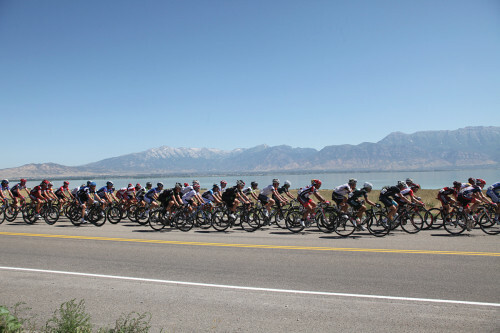 The peloton rides by Utah Lake in Stage 2. Photo by: Cottonsoxphotography.com. there, it was a mostly flat run into Provo with several long sections of false-flat roads leading into the technical sprint finish at the Shops at Riverwood. The GC effectively neutralized already, Stage 2’s mostly-flat roll promised to be one for the sprinters. But, as any racing fan knows, even sprint stages can pack some surprises in. The first came after the mild, but still noticeable, climb through Goshen Canyon. With no breakaway established after an intermediate sprint was absorbed, the peloton approached the feedzone just north of Mona. A couple of riders quickly tried to escape after rolling through, however, and created some tense moments of attacks and counter-attacks for the next several miles and the attention level was sky high for the rest of the stage. Heading into the final intermediate sprint, a breakaway including Endura Racing’s John Anderson and Kelly Benefit’s Michael Creed got away. They were allowed to dangle off the front for a while before the charge into Provo set the stage for some dramatic moments over the final few miles. With hundreds of fans lining the streets as the race roared through the south end of Provo, the teams with strong sprinters began a bit of gamesmanship lining things up. As teams lined up, youngster Tejay Van Garderen launched himself in a solo attack with about four miles remaining in the race. The peloton allowed him to dangle off the front as the course had a slight uphill approach to a technical finish. That technical finish, however, created some problems for several riders after HTC-Highroad’s Van Garderen was caught. First, a couple of riders anticipated the first sharp right-hand turn a few miles early and caused a crash at the front of the chase. Because the crashed happened far enough out, those hitting the asphalt were outside the ‘safe zone’ that would have given them the same time as the lead group. Included in the crash was Henao. The Gobernacion team rallied around the yellow jersey, however, and safely rejoined the peloton in time to retain possession of the overall lead. Jack Bauer took home the win in Stage 2. Photo by: Cottonsoxphotography. on for a 13th-place finish in the stage. Escaping the chaos behind them, Endura Racing took advantage of its position at the front of the pack set up a solid leadout train for its sprinter. Jack Bauer was out front as the group hit the turns and was able to hold a straighter line than most others. As he looked behind him to assess the situation with 300 meters to go, he saw a much larger gap than he anticipated and finished off the sprint himself, easily rolling across the line ahead of Liquigas’ Elia Viviani. Jesse Anthonhy won the sprint to take Stage 1 after being in the break most of the day. Photo by: Dave Iltis. See more at gallery.cyclingutah.com. Henao stayed in yellow but Leipheimer ended the stage licking his lips in anticipation of the Stage 3 time trial that lay ahead. By now, it was clear the Gobernacion de Antioquia team was not to be taken lightly in the mountains. What wasn’t known by most was how they would fare in a race against the clock. Also know was Leipheimer’s ability to throw out some serious wattage in the Race of Truth. At just less than 10 miles in length and on virtually flawless pavement, the Stage 3 time trial figured to shake up the race for the yellow jersey. In fact, after Stage 2 wrapped up, Henao admitted he expected to cede the overall lead to Leipheimer but try to limit his losses. After Tom Zirbel set the mark early in the day at 18:03, racers battled the heat and wind trying to climb up the overall standings. Van Garderen, celebrating his 23rd birthday, had the ultimate reason to celebrate in the end as he nailed his ride with a 17:33 time and found himself in the hotseat with a handful of riders still on the course. Leipheimer was the only threat remaining and as Van Garderen watched the seconds tick off the finish line clock, he cracked a big smile and pumped his fists in victory as the Radio Shack veteran tripped the clock six seconds slower than the newcomer. It was Van Garderen’s first race victory as a professional. Leipheimer’s time, though, was 1:09 faster than that posted by Henao and handed the yellow jersey to the former Utahn with two stages left to race. 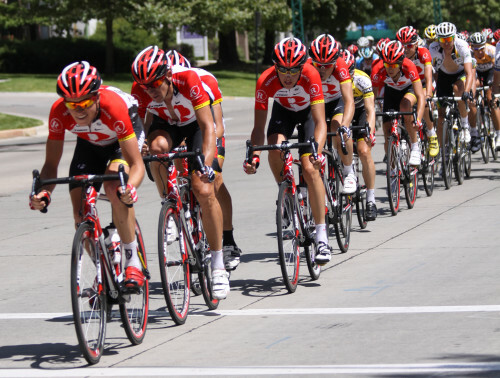 If the Tour of Utah hadn’t dished out enough punishment already, it went into pain overload Saturday afternoon. Starting and finishing in the shadows of the Utah State Capitol building, the 7.4 mile course through the Avenues and University neighborhoods unloaded wave after wave of hurt with its nasty climb from downtown Salt Lake City up State Street and the relentless attacks from teams hoping to shatter the field. The day began with a bit of bad news as Jesse Anthony, fifth overall in the standings thanks to his impressive win in Stage 1, withdrew from the race because of flu-like symptoms. He was not the only rider to pull out of the race that day, though. The wicked-fast pace – the peloton covered the 80-mile course at an average speed of 27.3 miles per hour – split the field into several groups and a trio of riders called it quits before the finish while four more missed the time cut after emptying themselves in an effort to help their team leaders. As expected, the Gobernacion team sent shockwaves through the field with a series of stinging attacks. A group of 18 riders got off the front and built a gap large enough to threaten Leipheimer’s overall lead. The Radio Shack squad was forced to organize a chase group at the front and do a lot of work as they tried to close the gap over the final few laps. But that effort came at a cost as Leipheimer found himself with only Brajkovic by his side for the final couple of laps. The gap was never fully closed and Gobernacion’s Janier Acevedo charged away from the field on the final ascent of State Street to pick up a five-second win over Team Type 1’s Javier Megio and Rubens Bertogliati . 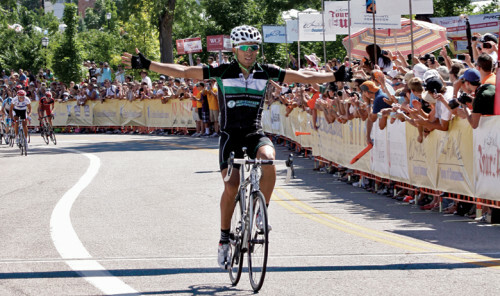 Mancebo, a former Tour of Utah winner and the runner up ion 2010, finished fourth in the stage to climb back up the overall standings a bit. Henao attacked Leipheimer’s chase group on the final lap and managed to pull away, chopping 33 seconds off the time he had to make up heading into the final stage – just 23 seconds away from the overall lead. Leipheimer was gasping for air and in a world of hurt as he crossed the finish line – still wearing yellow but 1:38 behind the stage winners. The scene was set. Levi Leipheimer wore yellow and the unknown team from Colombia was going to make him work his tail off to keep it. Starting in Park City, the race rolled through the rural farmlands of Oakley and Kamas. Already seen as the hardest day of racing in the Tour of Utah, Stage 5 added a few extra miles because of road construction near Kamas. Instead of hitting the moderate, but uncategorized climbs near Jordanelle, the Peloton was rewarded with a lightning fast descent through Browns Canyon. The detour through Oakley and Peoa added six miles to the day, making the stage 106 miles in length, but probably neutralized some attacks in the early miles. Several attempts to form a break were launched, but none stuck as the watchful eyes of the GC contending teams quickly neutralized each attempt. After the PureBlack team from New Zealand wrapped up the sprint points competition for Roman Van Uden – he started the day second in points to Acevedo but was not contested on either of the Sunday sprint lines – the tension in the peloton kicked up significantly as the riders turned down Provo Canyon with the first monstrous climb of the day in front of them. What was a large peloton immediately shattered as the field headed up the Alpine Loop. By the time the leaders reached Sundance, there were small groups of riders falling off the back. Gobernacion’s Acevedo soloed off the front to cross the summit ahead of Leipheimer and Henao on the first climb and GEOX-TMC’s Gian Paulo Cheula launched his own solo attack heading up Suncrest to claim those KOM points. The developing story, however, was how in the world Leipheimer would handle the attacks from Gobernacion. Shortly after the second KOM point, the lead group contained Leipheimer and Brajkovic from Radio Shack and an overwhelming seven members of the Gobernacion team. As expected, Gobernacion sent rider after rider up the road. 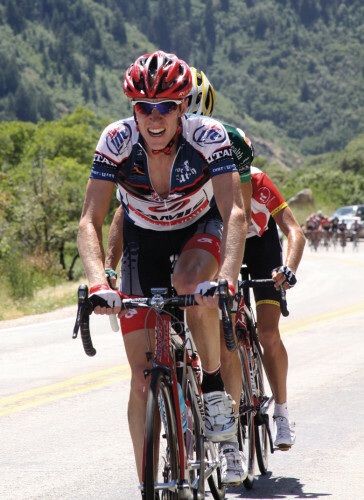 Leipheimer had no choice but to match those attacks to make sure no one, especially not Henao or Oscar Sevilla, was able to get away up Little Cottonwood Canyon. With Brajkovic as his lieutenant, Leipheimer stuck close to the wheel of Henao and never let him out of his sight. Surge after surge, Henao tried to shed Leipheimer and build a gap. But each attack was quickly matched and by the time the duo passed Tanners Flat – where a rambunctious crowd cheered them on and showered them with sprays of water – Henao realized he would not be able to pull away. Leipheimer, much as he did a year earlier, matched the pace set by his final stage riding partner and rolled across the finish line at Snowbird in second place for the day, but comfortably in first place overall. For stage results and complete overall General Classification, see page 9. For Complete Results and more photos, see cyclingutah.com. In addition to the prized yellow leader’s jersey won by Leipheimer and the sprinter’s jersey taken by Roman Van Uden, several other within race competitions were awarded. 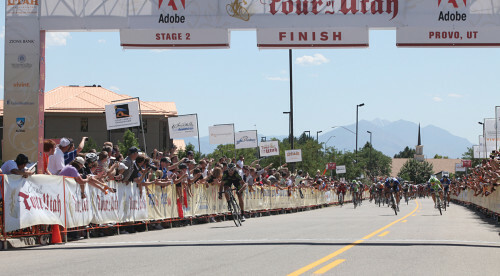 Typically, the Tour of Utah is a climber’s paradise. 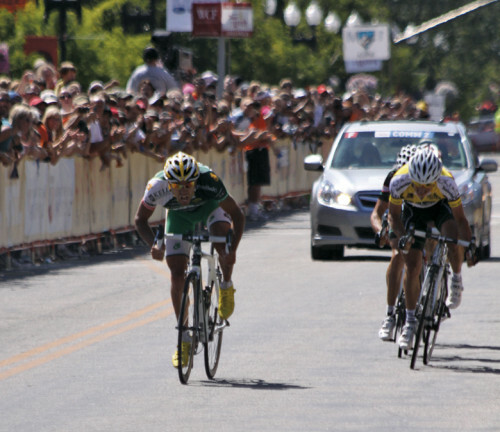 But the 2011 edition of the race featured only two stages with King of the Mountain points available and that made the North Ogden Pass climb extremely important. With three chances to earn points during Stage 1, the early breakaway jumped on those and Team Type 1’s Rubens Bertogliati seized the moment. By cresting the summit the first two times, Bertogliati earned the Ski Utah KOM jersey and – without any points to be earned for another few days – held it until he was popped off the back during the first climb of Stage 5. 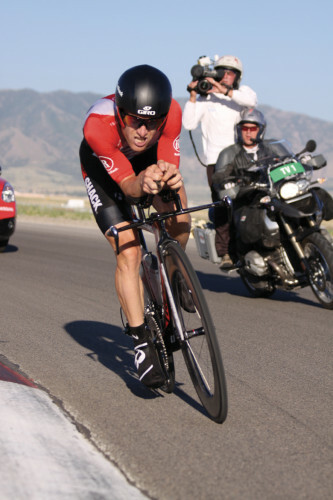 Leipheimer tacked on enough points to win the KOM race as he finished at Snowbird with 29 points. Gobernacion’s Janier Acevedo – who was first to the top in the Alpine Loop – was second with 28 points. The best young rider had plenty of competition and HTC-Highroad’s Tejay Van Garderen looked like the man to beat for most of the race. But with the overall title out of reach and the road tipping upward on the last day, Van Garderen fell off the pace a little bit. Gobernacion’s Cristian Montoya, however, was in the middle of the action throughout the race and soared up the mountain on the final day to claim the light blue Subaru Best Young Rider jersey by 46 seconds over BMC’s Chris Butler. Utah’s Chase Pinkham finished fifth in that race, 13:52 back. Gobernacion, fueled by their amazing ability to stay together throughout the race with few riders off the back on any stage, was easily the winner of the best team race and showered the crowd at Snowbird with celebratory champagne. The Colombian squad, which had seven riders all together as the lead group reached the base of Little Cottonwood Canyon, had an advantage of 4:58 over Garmin-Cervelo and 5:53 over RadioShack. For Complete Results and more photos, see cyclingutah.com.